Life Love Food: For 2: Dessert Tray! As a general rule, Boys love dessert! 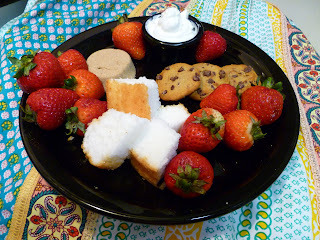 You can really impress them by making them think you spent a lot of time on a “dessert tray.” I literally put this together in like 5 minutes, and the boyfriend thought it was amazing to have, "something so impressive" for our Friday movie night. Check it out: leftover chocolate chip cookies from a work event earlier in the week, 1 piece of store bought angel food cake cut into 4 rectangles (Manager’s Special: 99cents), and some strawberries with sour cream and brown sugar for dipping on a black dinner plate. You might be thinking, “What strawberries with sour cream and brown sugar?” But, try it: dip a strawberry in sour cream and then brown sugar, it is like heaven! I “molded” the brown sugar by pressing it into a ramekin and then inverting it onto the plate (think sand castle), spooned some sour cream into a little container and then arranged everything else around those “anchors.” I highly recommend this for your next at home date night, just use whatever cookies, cakes, fruit, sauces and creative juices you have and the boy in your life will be impressed, or enjoy it yourself with a glass of wine! From my kitchen, where I am still avoiding the heat!